* Should I Choose a MALE or FEMALE Puppy? Puppy Booster Seat - often puppies get car sick because they can't be at horizon level looking out. This is a great booster for the ride home. Don't forget the seatbelt clip. I recommend the 36" Midwest Life Stages Double-Door Folding Metal Dog Crate. It has a removable partition that divides the crate for use with your puppy when your first bring him or her home. Once puppy grows the partition can be removed. TLC Whole Life Natural Dog Food provides natural and biologically beneficial lifelong nutrition to help your dog thrive. Their formula delivers the ultimate balance of quality meats, animal fats, vitamins and minerals to mirror your dog's natural diet. Each ingredient in TLC Whole Life is carefully selected for its nutritional and health benefits. Their animal and plant ingredients are never frozen and arrive fresh daily from local farms and oceans. 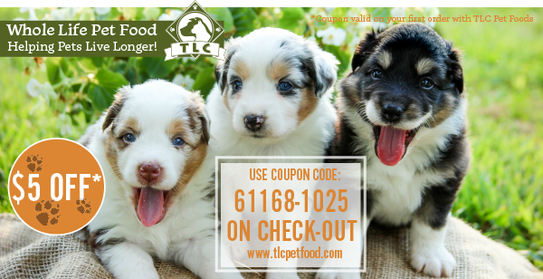 TLC Pet Foods delivers directly to your doorstep for FREE (both US and Canada), offering automatic shipping according to your puppy’s unique eating habits at no additional charge.